In the post immediately below this one, Tim takes a look at the ballistic myths behind stopping power and correctly points out that there is little difference between a well made .45 ACP and a well made 9mm bullet. Tim’s final point, and the correct point is that when choosing a round for concealed carry, choose the round you can afford to shoot the most. An extra hour of practice time will make a much more significant difference in your ability to defend yourself than the 0.095 inches of difference between a 9mm and a .45 ACP. 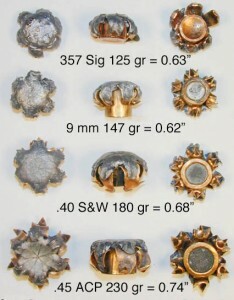 However, with that in mind are there times where choosing a .45 ACP over a 9mm makes more sense? Certainly. The first and most obvious is “you’re issued a .45 for work” and want to carry something similar off duty. Obviously, this only applies to people who carry guns professionally, but it’s a valid consideration. For example, you’re a part of an LE agency that issues the HK45, and for off duty you decide to carry something similar but smaller and opt for the HK45c. That way in a bad situation you can even use the mags from your duty gun in your carry gun, and share ammo between platforms. However, the vast majority of us are not issued .45s for any reason; so what other scenarios does a .45 make sense? The second example would be if you live in a state with limits on magazine capacity. If you’re limited to 10 rounds in the gun, all of a sudden that 10 round M&P45 starts making a lot more sense, as its 9mm brother holds the same number of rounds. I’m not saying this because you gain a ballistic advantage, but rather because the neutered 10 round magazines for M&Ps and Glocks (for example) frequently don’t work as well as the full capacity magazines. With that in mind, a 10 round M&P45 or 10 round HK45 starts to look like a good decision, because those guns are using the magazines they were designed to be most reliable with. The last place where I’d recommend a .45 ACP would be in the event that there’s an ammo crisis and good JHP ammo isn’t available. Luckily, the current ammo crisis seems to only be affecting the supply of practice FMJ ammo, but if all I had in this world was lead or FMJ ammo, I’d pick a .45 ACP shooting 200 grain lead semi-wadcutters over a 9mm FMJ. That last scenario is a little far fetched sure, but that would be the time I’d rather have a .45.